Teachers’ Day has been an annual celebration in India since 1962. It is held on 5th September, the birth date of Dr Sarvepalli Radhakrishnan, the second President of India. Children attend school as usual but, instead of normal classes, hold celebrations in appreciation of their teachers. Children at CRS’s 8 urban slum centres and four rural village schools celebrated in the day in their own ways. 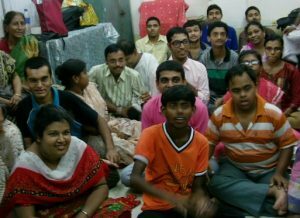 The students of CRS’s Training Center for Differently-abled Persons also held a celebration, enjoying a sing-a-long with their carers and teachers. In addition CRS organised a small get-together at the office headquarters to thank the teachers who make such an important contribution to the lives of children from poor and underprivileged backgrounds.